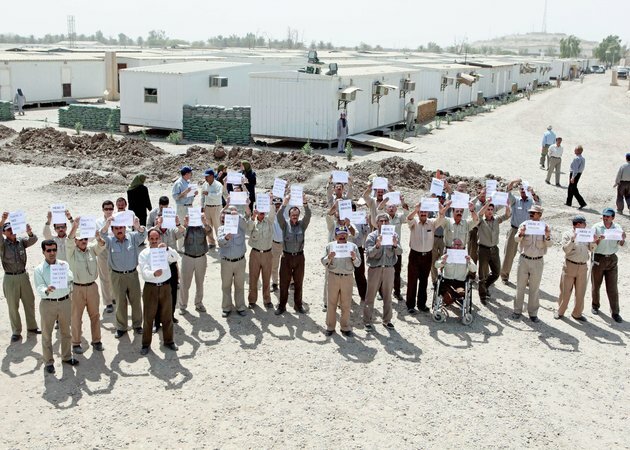 It is over two weeks now that in an anti-human and criminal measure, government of Iraq is barring entry of medicine and food to Camp Liberty using fictitious excuses. Many of the essential foodstuffs in the camp are either completely consumed or about to be finished and the sick are facing shortage of the medicine that they need. Additionally, Iraqi forces systematically hamper transfer of patients to hospitals. In a recent case on March 16, as the ambulance was leaving the camp, two of the interpreters of the patients were prevented from accompanying the patients and only after two hours and switch of the interpreters, the ambulance left the camp;however due to the delay, a number of patients were too late for their medical appointments and fruitlessly returned to camp. Blockade of the foodstuff is a new method of tormenting and harassing the residents of Camp Liberty by the orders of the Iranian regime. The 5-year-old medical siege that has now taken on added dimensions has so far resulted in the tormenting to death of 18 residents. In a conference at the United Nations Headquarters in Geneva on 14 March 2014, Professor Jean Ziegler, member of the Advisory Committee of the UN Human Rights Council, draw a parallel between the siege placed on Camp Liberty and that of areas under siege in Syria and said: “According to article 54 of the Fourth Geneva Convention, imposition of hunger on citizens as an act of war is prohibited” and “the Rome Statute that lays the foundation for the International Criminal Court, accentuates that intentional acts to impose hunger on citizens as a war method by depriving them of items they need in order to stay alive, is a war crime”. He referred to the condemnation of CharlesTylorin 2008 by UN special court for crime against humanity in imposing hunger on residents of four cities in Liberia and said: “It seems that this war crimeis becoming rampant by leaders of the countries in the region. Thorough criminals such as the regime of Bashar al-Assad, the regime of Iran, and the regime of Maliki regarding Camp Liberty, should be exposed right now”. Moreover, this criminal blockade is a flagrant transgression of the 25 December 2011 Memorandum of Understanding between the United Nations and the Government of Iraq that explicitly says that “The Government shall facilitate and allow the residents, at their own expense, to enter into bilateral contact with contractors for provision of life support and utilities such as water, food, communications, sanitation, and maintenance and rehabilitation equipment” and “shall permit the United Nations to carry out monitoring of the human rights and humanitarian situation… and establish procedures for the reporting of complaints”. This blockade is also a serious breach of the quadripartite accord of 16 August 2012 between the United States, the United Nations, the Government of Iraq, and the Ashraf residents. In this accord, the U.S. government commits itself to “support safety and security of the residents until the last of the residents leaves Iraq” and to resolve issues at “Camp Liberty that materially affect the daily lives of the residents including sustainable mechanisms to provide water and electricity”. These commitments were once again reiterated by the U.S. State Department in a 29 August 2012 statement. Given the abovementioned facts, the Iranian Resistance calls for the immediate intervention by the United States and the United Nations to end this criminal siege commensurate with their lawful duties and their repeated and written commitments on the safety and security of Camp Liberty residents and not to allow Government of Iraq to pave the way for another great massacre with these suppressive measures.